Dr Knox is very experienced in surgery for hallux limitus and hallux rigidus and has recently published a thesis on the condition within the Journal of American Podiatric Medical Association. 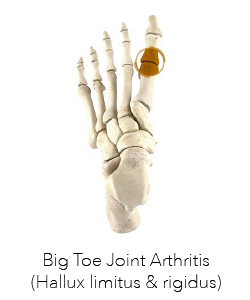 The surgical procedure aims to help improve and maintain motion of the big toe joint, eliminate painful symptoms and prolong long-term joint health. The surgery is performed under general anaesthesia on a day surgery basis and takes approximately 30 minutes. Generally hallux limitus surgery involves shaving off bony spurs around the big toe joint surface and using special drills to repair areas of damaged cartilage. Patients are able to weightbear immediately post-surgery and usually return to normal work activities after 2 weeks. This website is intended for general information purposes only. Any surgical or invasive procedure carries risks. Before proceeding, you should seek a second opinion from an appropriately qualified health practitioner. For more information on hallux limitus surgery in Perth, we recommend making an appointment to see our specialist podiatric surgeon Dr. Andrew Knox.